Japan’s interest in regionalism relates primarily to economic aims. Some policymakers want to reduce government spending and pursue a kind of ‘fiscal federalism’ in which central government devolves taxes and economic strategies to regions. The UK has minimal experience in this field. Devolution was driven more by local demand for representation. 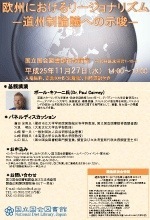 So why would policymakers in Japan be so keen to learn from the UK? 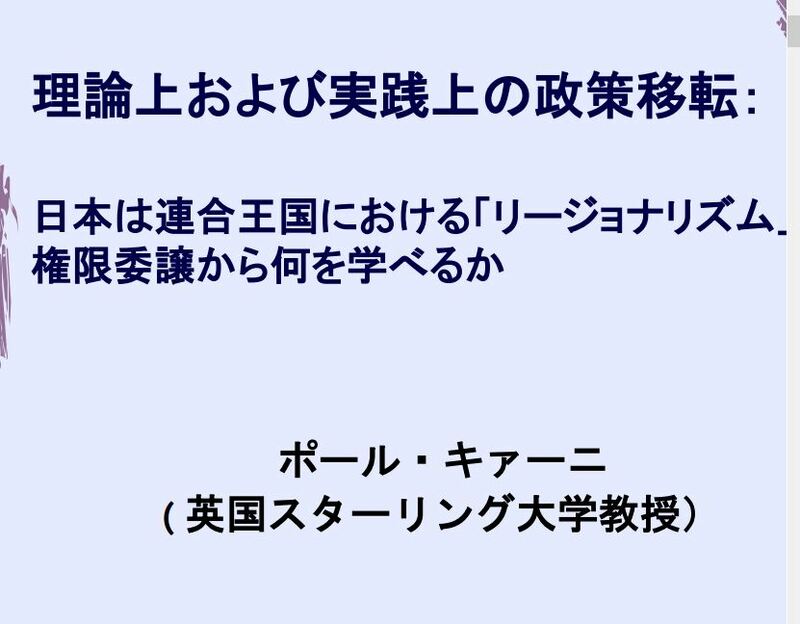 That is the context in which Professor Yamazaki and I have written this paper, to be presented to the National Diet of Japan next month. This example reinforces the idea that ‘lesson-drawing’ is not straightforward – it requires a meaningful conversation between those who want to learn and those reflecting on their own experience. The full paper is here – Cairney Yamazaki What Can Japan Learn From UK 23.10.13 – and the bullet point summary is below. Here is a link to one of the events, and here is my mug shot surrounded by some impressive looking writing – NDL Cairney poster. Here is the 2-language powerpoint – Dr. Cairney’s Presentation (it doesn’t match up entirely because I amended the version sent to me). Policy Transfer in Theory and Practice: What Can Japan Learn from ‘Regionalism’ and Devolution in the UK? ‘Regionalism’ can be defined broadly as the creation of a governing tier between central and local government. However, we can only use the UK experience to give relevant insights to policymakers in Japan if we understand why they seek, and how they will use, that information. Lesson-drawing will not be successful unless the borrowing government understands how and why policy developed in the lender – and if that experience is comparable to its own. Our comparison of the UK and Japan identifies major differences in their politics and policymaking. These differences should be borne in mind when policymakers in Japan seek to learn lessons from the UK’s regionalism policy. The main difference is in their respective reasons for pursing regionalism. In the UK, devolution to Scotland and Wales reflects an attempt by the centre to address growing demands for self-government. In Northern Ireland, it reflects an uneasy compromise between unionist and nationalist actors. Only in the English regions can we see an economic frame of reference. Further, the economic frame did not help sustain support in the English regions. In Japan, it is difficult to identify equivalent levels of regional identity and popular support for regionalism. The economic driver is much more significant. Regionalism is often presented as a way to promote more effective economic development and to reduce the size of the state and public debt. In that context, the UK experience has limited information to offer. Instead, it can only offer negative lessons about the inability of an economic frame alone to provide sustained support for regionalism. More relevant lessons can be found when we identify the likelihood of asymmetric regionalism in Japan. Devolution may be extended primarily to Hokkaido, Okinawa and the Osaka/ Kansai region. The UK has extensive experience of asymmetric regionalism, with varying levels of support for devolution translating to different arrangements in Scotland, Wales, Northern Ireland and the English regions. The most sustained and significant level of devolution can be found in Scotland. Scotland’s experience demonstrates that policymaking can be directed, and meaningful networks formed, at the regional level. The Scottish Government has developed its own policymaking style which often seems to benefit from its size and the ability of policymakers to develop relatively personal networks with actors such as interest groups and bodies such as local authorities and quangos which implement (and seek to influence) policy. It has also developed meaningful relationships with business groups, albeit in the context of an economic policy reserved to the UK. However, this style has taken some time to develop – it is not a quick fix to an immediate economic crisis. The UK experience also shows that the centre can maintain smooth relationships with devolved governments. Their interactions almost never produce a need to engage in formal dispute resolution. However, part of the explanation is that the UK centre has largely disengaged from devolved policymaking (a situation aided by its devolution of discrete policy areas – such as health and education – with relatively low levels of overlap in central/ devolved responsibilities). There is considerable evidence of policy divergence (or, at least, similarities) but largely because each government understands and seeks to address policy problems in similar ways, or because UK policy for England puts pressure on the devolved governments to respond. Meaningful learning and transfer between regions, or from regions to the centre, is unusual. Overall, our analysis demonstrates the need to be clear about how and why one country can learn from the experience of another. It is not enough to transfer programmes. One must understand how and why policy was made in one country to understand if that process can be replicated in another successfully, or if it can only take broad inspiration. What Can Japan Learn from ‘Regionalism’ and Devolution in the UK?